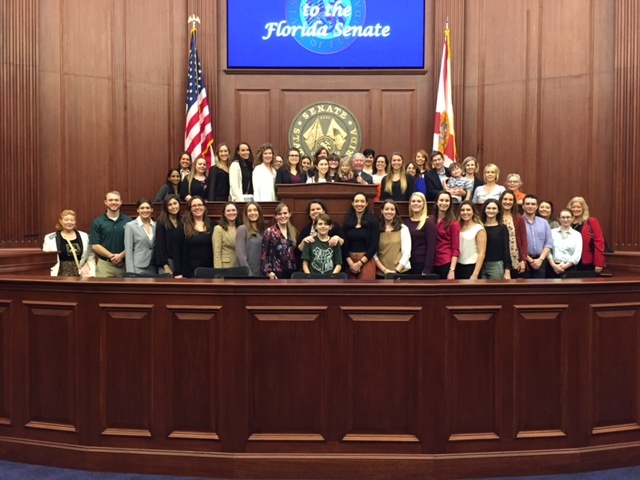 Students and faculty from USF's Doctor of Audiology program attended the Children's Hearing Technology Day at the Capitol in Tallahassee, FL on January 11. Also in attendance were students and faculty from UF and FSU, as well as families and children with hearing loss. The purpose of this event was to lobby for SB 890, a bill introduced in the Florida Senate, and it's companion bill introduced by the Florida House, HB 1427. These bills would require insurance companies to provide benefits for children's hearing aids. The Florida Academy of Audiology sponsored this event so legislature members would be encouraged to co-sponsor the bills. The event was a huge success!